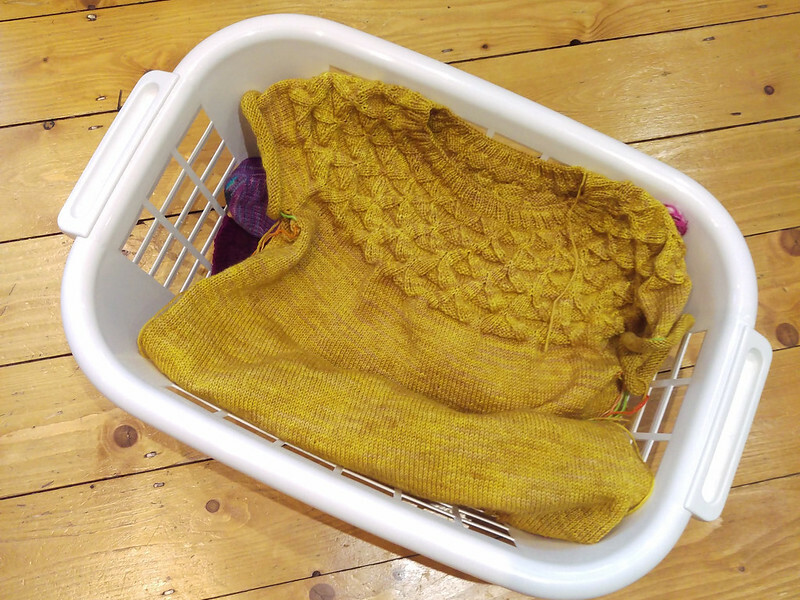 I had planned that my next large piece of knitting would be a baggy cardigan – a garment that I really need in my wardrobe especially as my recent FO Big Blue Bouclé Cardigan didn’t quite fit as hoped – but you know how it goes, sometimes you just see something and know you have to make it. 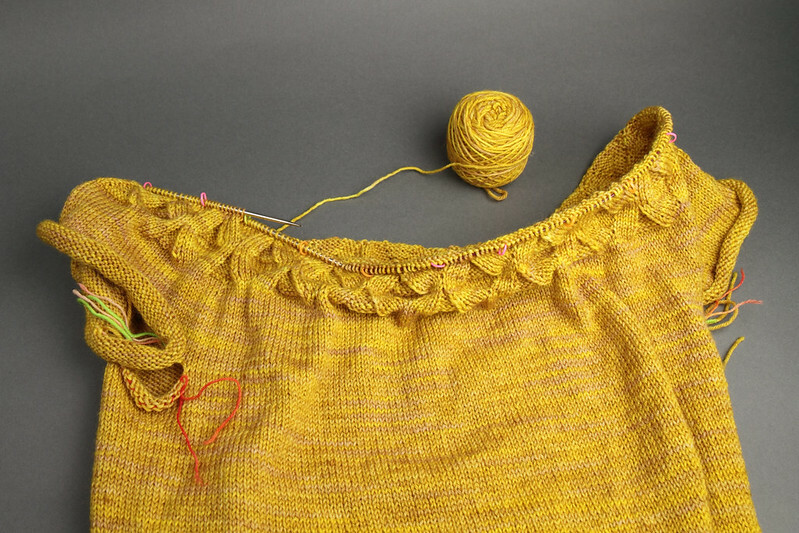 That’s exactly what happened when I saw Gudrun Johnston’s stunning Kirigami Pullover from Brooklyn Tweed’s Winter 2018 Collection. I don’t know if I’d call myself an impulsive knitter; I like to plan my projects carefully, thinking about the materials and the about the best way to approach them, but it’s always nice to be able to strike while the iron is hot, and work on a project while you have that initial burst of enthusiasm! Kirigami is a relaxed fit, seamless yoke sweater with a highly original geometric textured stitch design circling the yoke. It has an origami-like appearance (hence the name, I’m guessing), created entirely with shaping, I’d class it in the ‘faux cable’ category. 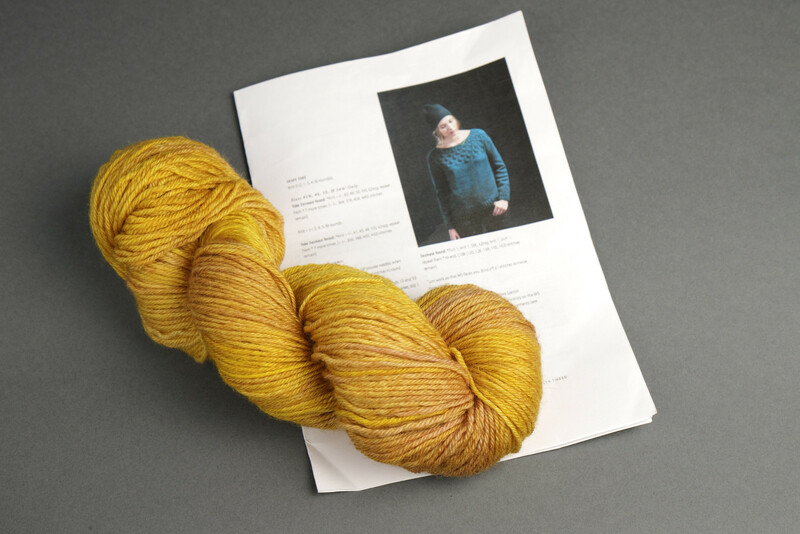 Best of all, it’s design for BT’s Arbor yarn – a worsted-spun DK weight which can be substituted for your favourite smooth, sturdy DK. Naturally, I chose our Dynamite DK British BFL yarn and I created this golden yellow shade, Colonel Mustard, especially for the project because it just had to be yellow. When choosing the size for a new garment, I find that the best method is to pull out an existing garment from my wardrobe that has the fit I want, measure it, and find the closest pattern size to the garment measurements. For those of us that are not a standard shape and size, using the widely accepted methods of basing the sizing decision on the bust measurement is a terrible idea (in my case that will lead to huge shoulders and baggy underarms). Brooklyn Tweed patterns always have very detailed schematics and specify intended ease and actual ease on model, which normally makes sizing decisions straightforward, but yoke sweaters are always a little tricky because they have no discernable shoulder point (where the cap sleeve would meet the shoulder seam on a tailored garment). Not only that, it turns out that I have zero relaxed fit sweaters! I gave it my best guess and chose the third size, giving my a whopping 6 1/2″ ease because I like the generous fit shown on the model (5 1/2″ ease). I have unfortunately had a few weeks of rather poor health, but at least give me the opportunity to make a lot of headway with this new project and power through the mindless stocking stitch sections. This really did feel like a slog and I don’t normally find that of a DK sweater. I used the suggested needle size of 3.75mm to get gauge, which is slightly tighter than a standard DK knit, and that combined with the extra ease really had a noticeable impact on the effort involved [I can’t see myself knitting a sweater in a finer gauge any time soon]. Getting to the fun bit happily coincided with me feeling a bit better and mentally ready for something with a bit more interest. Firstly and most importantly, given the absence of a relaxed-fit yoke sweater for comparison, I have no way to determine how long the sleeves should be in advance. I have no idea where the underarm join will fall on this particular yoke sweater, or how loose the yoke will fall on my shoulders. I typically add 2-6″ on top of the pattern sleeve length to get the right fit on me (I am unusually tall and long-limbed), so I’m not going to attempt to guess! Secondly, I just got a copy of the excellent book Cast On, Bind Off by Leslie Ann Bestor (a stitch dictionary for cast ons and offs), and I wanted an excuse to try out one of several new-to-me provisional methods. The yoke zipped by in comparison to the body, and was so much fun to knit. I added markers between each pattern repeat (a lot of markers), which is something I would not normally do (especially as it wasn’t specified). I don’t know whether it was because I was still feeling a little off, or that the pattern is such that it’s not that easy to follow by eye, but I feel like this helped a lot. I only made two small mistakes, which thanks to the markers I spotted immediately. It’s not a difficult pattern but I have never seen a chart with so many different types of increase and decrease! My only modification was to make my M1s symmetrical. I have no idea whether this made a difference but it was an easy thing to do, so why not? The finish on the neckline is sturdy and crisp, and with it done I was finally able to try it on and check the sizing. Phew! It fits, and I am glad I didn’t make it smaller because it would have actually been tight in places. Before I go any further it’s off for a little wash. A machine wash (yes, I machine wash) should be enough to relax the textured yoke so I can determine the sleeve length. I am not looking forward to being stuck on ‘sleeve island’ given how laborious the body seemed, but at least I have the buzz of knowing this will be an absolutely stunning finished garment to keep me motivated! I just love the yoke on this. I also love the suggestion of pink in the basically yellow yarn. I’ve never read a knitting blog before but just thought I’d check it out. Ive started my first jumper knitting on circulars. Its very basic shape sleeveless top in two yarns silk/linen knitted together. 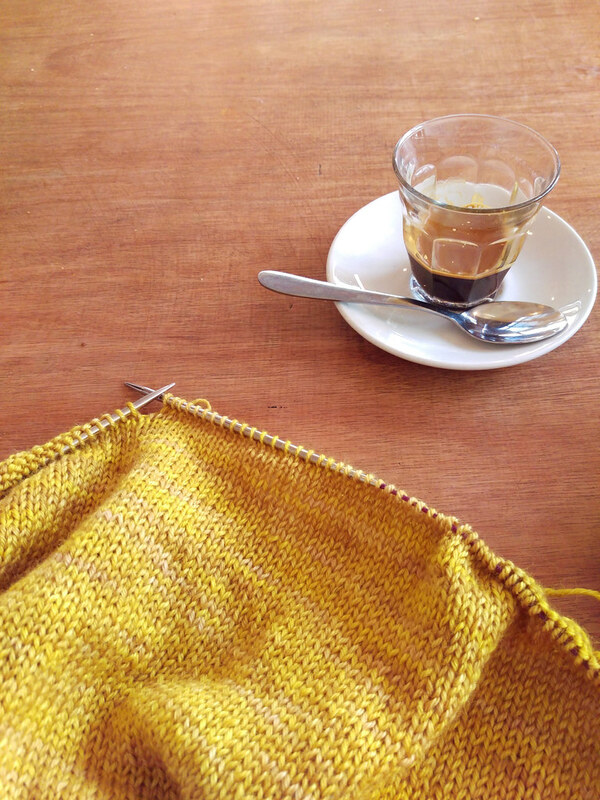 I got so fed up with the tiresome task of sewing together a garment once it’s knitted. That process can make or break a perfectly knitted garment. I was interested that you wash the garment before knitting the sleeves but I can totally see why. I’m looking forward to seeing the final picture when it’s finished. I think knitting this way may be the way to go for me.